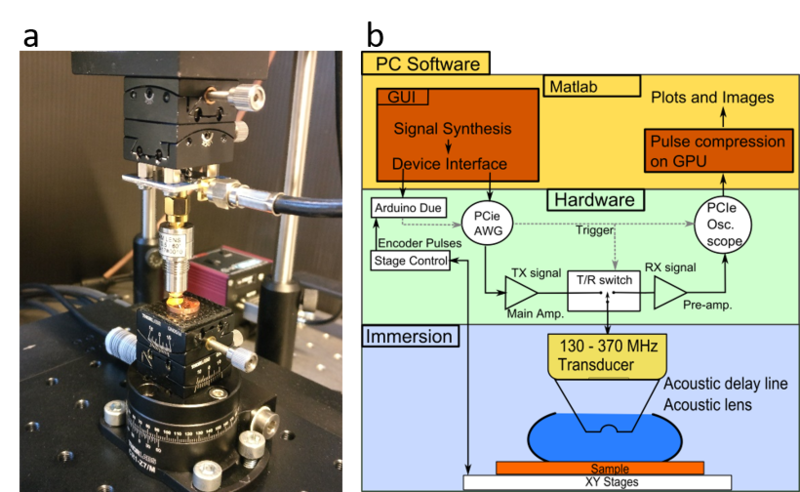 We have a unique custom built ultrasound microscope that features coded signals with phase information (Fig 1a). The band width is 100 MHz to 1200 MHz, the resolution is 1 µm to 2.5 µm depending on conditions with a scan area of 10*10 mm2, the imaging time is 2 mm2/min at highest possible resolution. Principle of operation (Fig. 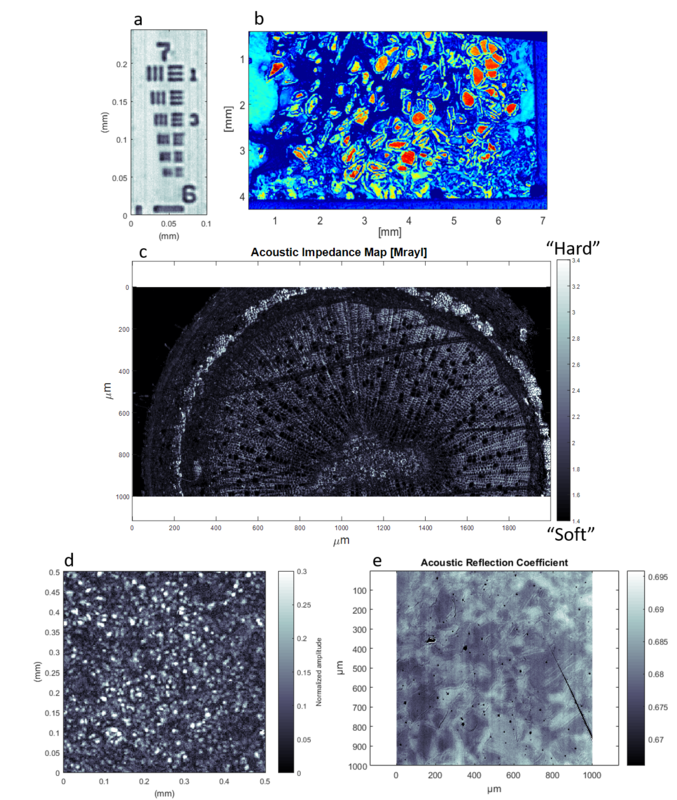 1b), Fig 2 shows (a) images of calibration artefact, (b) human radial bone with implant ingrowth, (c) twig of birch at 2.5 µm resolution, and (d) image of cells of fresh fig tree leaf buried under 50 µm wax layer, (e) image of copper disc of accelerating structure for CERN (European Center for Nuclear Research). Figure 1. a) Photo of the ultrasound microscope and b) block chart of the operation principle. Figure 2. Images of a) calibration artefact, b) human radial bone with implant ingrowth, c) wig of birch at 2.5 um resolution, d) cells of fresh fig tree leaf buried under 50 um wax layer, and e) copper disc of accelerating structure for CERN. We have been developing methods to improve steel quality control by characterising inclusions and pores in rolled steel samples. 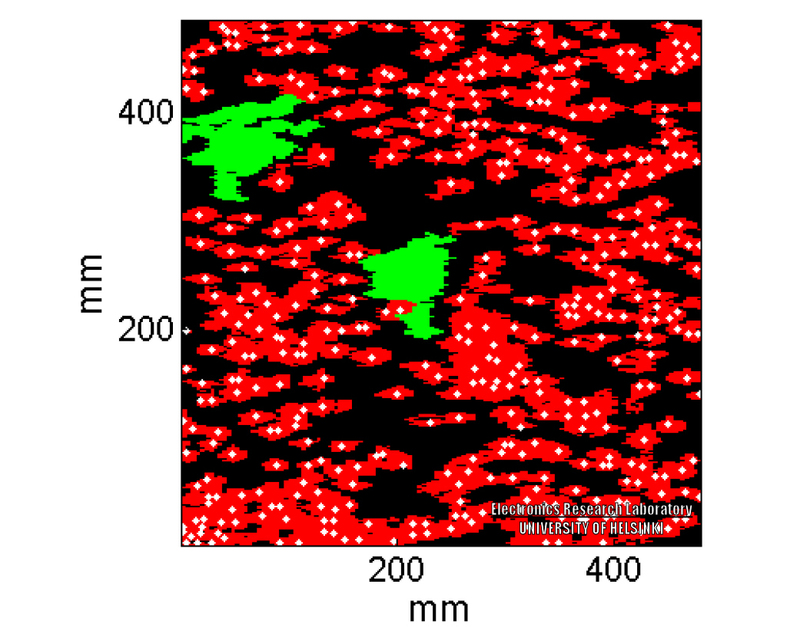 A 10 MHz amplitude C-scan showing inclusions/pores inside a bearing steel 100Cr6 sample. Three inclusions/pores were identified by the method. We have been employing immersion ultrasonic methods for defect detection in polymer samples. 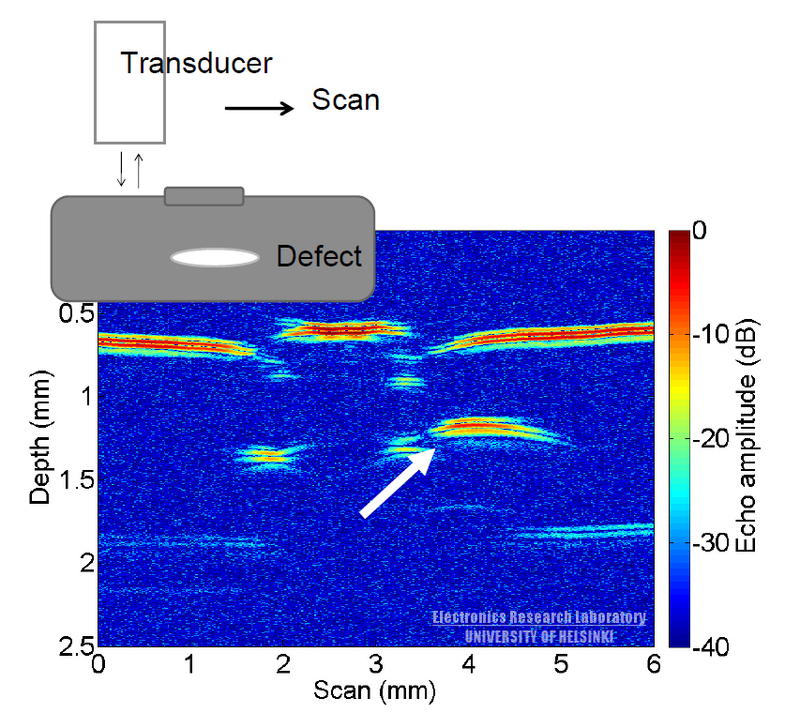 A 30MHz ultrasonic transducer is scanned in immersion over ~1 mm thick polymer structure, which contains a defect. 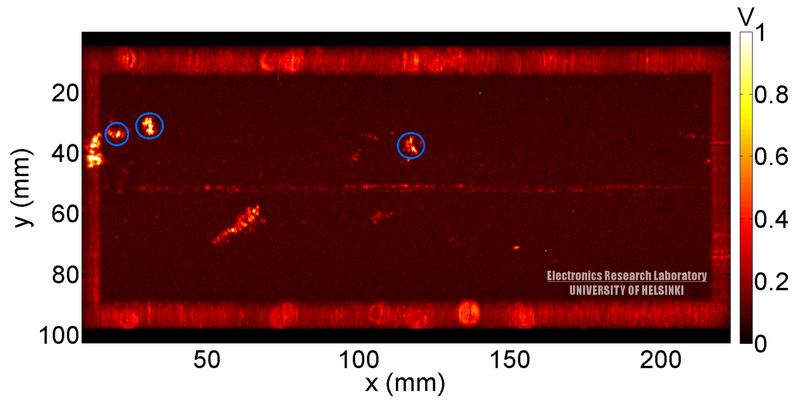 Resulting B-scan shows polymer containing an air bubble defect (marked with an arrow). We are also developing phased array methods to allow dynamic focusing and faster scanning speeds for industrial purposes. 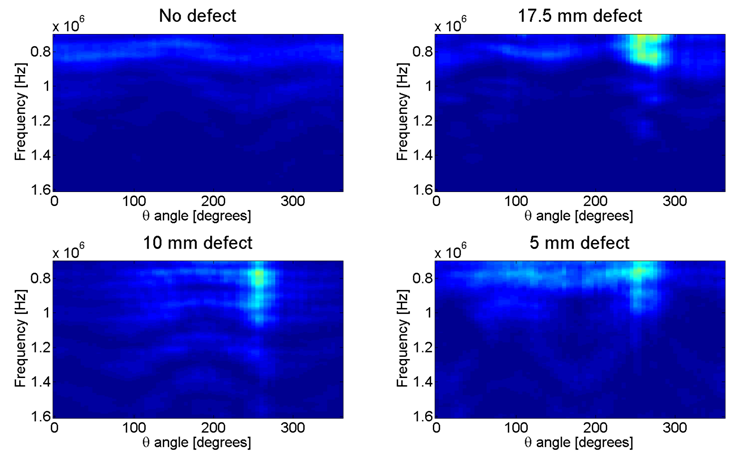 Characterization of structural defects in cheese blocks. A 128 element 2 MHz ultrasound phased array is used to produce images of cheese blocks for automated defect classification. Top view of an 85kg cheese block scanned and analyzed with a structure characterization algorithm. Red area represent identified cheese eyes and green identified cracks defects. The ERL Quantitative Ultrasonics Team performs research on complex materials, both manmade and natural. Our interests span everything quantitative that can be done with ultrasonics: evaluation of mechanical properties (stiffness tensor components, shear properties), viscotic properties (loss modulus, attenuation) and changes in them. Most research is done non-destructively, thus allowing the same samples to be probed with other measurement methods.We also combine quantitative ultrasonics with other measurement techniques, e.g. X-ray scattering and mechanical testing. For further information about the team, please contact the team leader Dr. Ari Salmi, ari.salmi (at) helsinki.fi. We aim to study whether one can experimentally detect defects in adhesion between a metal hemisphere and a polymer shell. To this end, we built a custom made contact and a non-contact setup to launch ultrasonic waves that propagate along the hemisphere. The presence of extra echoes and changes in the Fourier transform as a function of angle allowed us to quantitatively determine the location of localized non-adhered areas. Samples. (left) Hemispherical cavity milled into UHMWPE base, a 17.5 mm hexagonal hole in the base is visible. (right) Steel shell dislodged out after gluing, featuring glue everywhere except at the location of the hexagon. The coordinate system used to localize the defect is shown. Detecting a localized defect in adhesion. FFT of received signals as a function of θ. (top left) reference sample, (top right) 17.5 mm diameter defect, (bottom left) 10 mm diameter defect and (bottom right) 5 mm diameter defect. 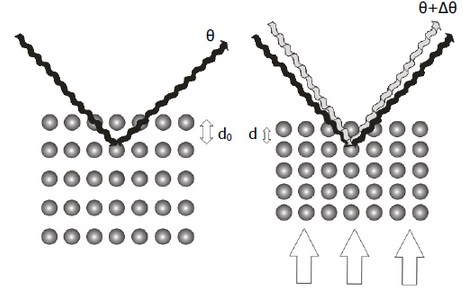 We combined standing wave ultrasonics and X-ray diffraction to quantitatively determine the mechanical properties of the unit cell of materials. Part of the research was performed at the ESRF Grenoble facility.